Here’s a movie, “While We’re Young”, that contrasts two stages of adult life — middle-aged forties vs. twenty somethings — and touches on enough marriage and family angst to satisfy ten films. Writer-Director Noah Baumbach packs four fictional documentary filmmakers — all of them quirky — into one narrative, creating excess competitive tension. Ben Stiller (Josh) is a middle-aged documentary filmmaker who’s stuck on a project. His wife Naomi Watts (Cornelia) is also a documentary filmmaker who works with her father. Not surprisingly, the father, Charles Grodin (Leslie), who appears to be the dean of documentary filmmakers, has a strained relationship with his son-in-law Josh. How many times am I going to have to write “documentary filmmaker” in this one movie review? The story might be better without the intrusion of the older filmmaker. Charles Grodin’s take on the character is great, but really, the old guy is a peripheral character. Most of the tension, comic and dramatic, is between the two couples, one young and the other middle-aged..
Adam Driver (Jamie) is the fourth and youngest documentary filmmaker. He’s married to Amanda Sayfried (Darby). I’m relieved to report that Darby makes ice cream, not films. I was impressed by Driver’s deft portrayal of the young and somewhat ruthless filmmaker. Stiller, with his piercing eyes, puts heartfelt intensity into the conflict between Josh and Jamie. The two couples embark on an improbable intergenerational friendship, filled with glowing mutual admiration and envy in the beginning. The awkwardness of the friendship is good for humorous scenes at first. Alas, the friendship begins to sour about halfway through, and the comedy morphs into serious drama. I won’t give away any more of the complicated plot, except to say that it leads to a serious dispute over documentary ethics between Josh and Jamie. A secondary theme about parenthood is not fully developed, but it’s a worthwhile counterpoint to the main theme, professional striving. 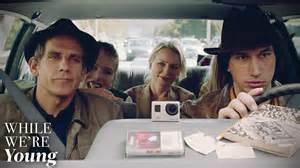 While We’re Young might disappoint if you’re looking for a barrel of laughs from beginning to end. The comedic part of the film is good, but the drama at the end is excellent. I’d see it again.